Tuberous perennial with narrowly lance-shaped, stem-sheathing, deep to mid green leaves up to 40cm long. Yellow, white or purple flowers, emerging from the upper leaf axils in summer. Likes a cool, sheltered location in part shade and moist, well drained, moderately fertile, humus-rich soil. May need protection from severe frosts. Plant tubers 15cm deep, in winter or early spring. 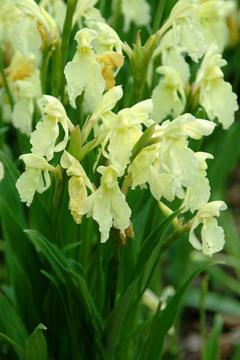 Woodland gardens, peat beds or damp shady borders.